If you’ve got sensitive skin you’re in for a treat, because two new additions have been made to the skin-soothing Klorane Cornflower range! Cornflower has particularly potent softening and anti-inflammatory properties that work in perfect balance with the skin. The French cornflower that is used in each product has been harvested during full blossom and dried out in special clay ovens. The resulting cornflower water is distilled from these flowers with all of the precious active ingredients and purity still intact, making for an effective natural extract. The ultra gentle Klorane Soothing Make-up Remover Gel removes all traces of make-up without disrupting the delicate balance of your skin. The lightweight gel texture is really refreshing thanks to its Cornflower Water formulation, making it perfect for soothing sensitive skin. Ophthalmological and dermatological controlled testing has ensured that the gel is suitable for both sensitive eyes and contact lens wearers. If you’re suffering with a puffy, congested undereye area or dark circles, try the Klorane Smoothing and Relaxing Patches on for size. Pop one of the miniature express beauty treatments onto the eye contour for 20 minutes and remove for instantly brighter and smoother skin. This pack includes 7 sets of 2 patches which can be used every day for intensive treatment, or once in a while for a bit of pep. Relaxing camomile extract soothes the thin skin of eye area, while arnica extract decongests. 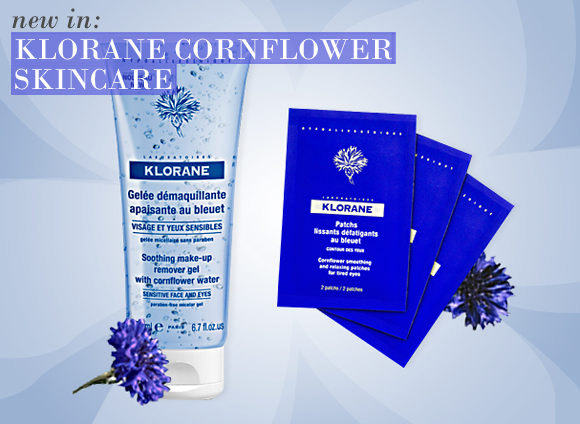 Discover the entire Klorane Cornflower range right here at Escentual.com. This entry was posted on Thursday, November 10th, 2011 at 3:45 pm and is filed under New products, Skincare. You can follow any responses to this entry through the RSS 2.0 feed. You can skip to the end and leave a response. Pinging is currently not allowed.